It’s kind of funny how I ended up going to Indian by Nature because those exact words are probably what some people would use to describe me. This is mainly because my best friend M is Indian, and her family has practically adopted me. I am fascinated by Indian culture, and was thrilled that my bridal shower (organized by my best friend) was Indian-inspired. I even have a built-in bindi (sort of Harry Potter-esque), and an Indian visitor once joked that if I ever visited India, I would be propped up on an elephant and paraded around like a princess. But for all my semi-Indian-ness, there wasn’t much I knew about Indian food. I pretty much just ate what my “foster mother” cooked, no questions asked. I’d be told what it was, but I would soon forget and just chow down. The prospect of trying out an Indian resto thus both excited me and intimidated me. I liked all the stuff I had tried over the years (even the stuff that M and her sister passed on, and that their dad happily sent my way) but I realized I had no idea what authentic Indian food was supposed to taste like. So what was I to do but drag M along on this assignment? On our little Indian by Nature dinner date, I learned three things about Indian food. 1. Indian food comes in four main colors. Beside each dish on the menu was a parentheses, indicating its color. A dish could be one of four colors: red, green, yellow, or brown. Unfortunately, I ignored these helpful little notes and ended up with a very red tabletop. The only things that were non-red were the complimentary bowls of chutney served alongside free papadum. Not exactly a well-rounded meal. Should’ve asked R, a hard-core veggie Indian friend, to tag along. 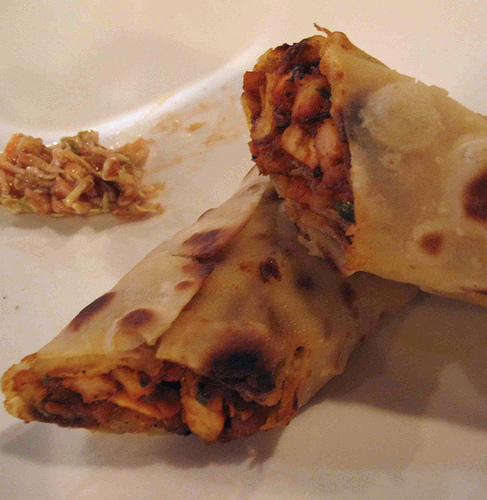 M and I started off with the Chicken Kathi Roll—toasted pita bread with fresh veggies and chicken, “cooked in Indian spices and herbs.” M’s verdict? It was good, but had a little too much ginger for her taste. I asked her where she’s had the best chicken kathi roll ever. I was fully expecting her to say somewhere in Mumbai. But instead, she replied, “New York. You know those little carts on the street?” Hmmm. 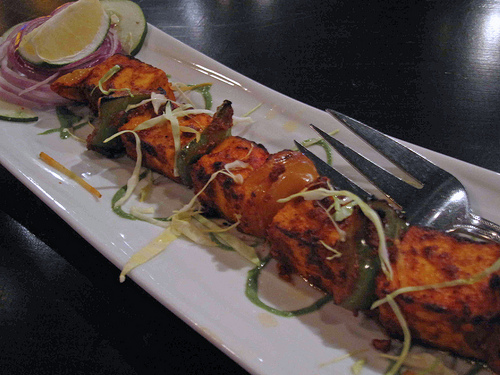 Next up in our Parade of Red: the Paneer Tikka. Described as “pieces of cottage cheese, capsicum, onion, and tomato cooked in famous Indian Tandoori flavor,” they were essentially big cubes of slightly crumbly cheese covered in a thin, subtly crispy shell of spices (all red). It’s been a while so my memory could be playing tricks on me, but right now I’m salivating just thinking about it! While we were deciding on our main dish, the Indian chef came out to greet us. I’m not sure if he does this all the time, or if the waiters just told him that there was an Indian guest. (In fact, the waiters seemed to love the fact that M was there, telling her about their mostly Indian clientele, and about the Bollywood star who was in town recently.) 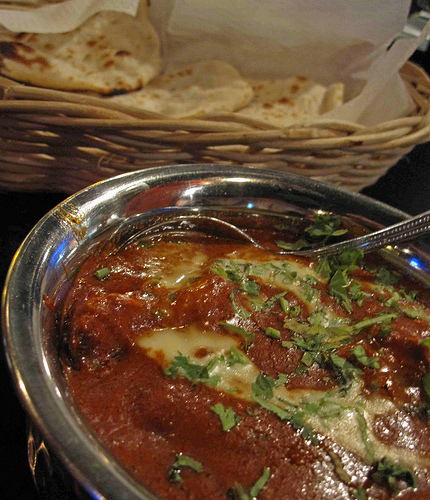 Chef could see that we hadn’t made up our minds, so he suggested the Chicken Tikka Masala. M reasoned that the chef would know best, so we took his word for it and ordered his recommendation. The boneless chicken cubes were swimming in a sea of masala sauce, made of secret Indian spices of course. I think I would have really liked this dish if only I hadn’t had similar flavors earlier on. 2. Indian food is all about the spices. This I already knew–walking through Little India (possibly my favorite place in Singapore) is enough to tell you that spices, glorious spices, are an indelible part of Indian cuisine. M’s first comment when she walked into India by Nature? “I could really smell the spices.” As soon as you walk through the door, you catch a whiff—nay, a blast of the powders and seeds and secret sauces in the kitchen. It’s sort of like entering Jollibee where you immediately detect that Yum Burger smell, only here, the aroma is stronger and seems more…natural. 3. Not everyone agrees what “authentic” Indian food is supposed to taste like. As we hung up the phone, I asked M about what real Indian food is supposed to be. Is it not supposed to be that flavorful? She thought for a minute. “Even in India, my massis (aunts) ask the cooks to lessen the spices. But I guess it’s really like this,” she remarked. So I figured that it really is just a matter of preference. Just as there are a hundred different ways to cook adobo, there’s not a single way that, say, masala “should” be done. And in the end, if the meal tickles your palate, and leaves you satisfied and rubbing your belly, authentic or not, it’s pretty much done its job.